I mentioned that we bought some DVDs and music CDs yesterday. Two CDs to be precise, both by King Crimson. I'm still slowly and almost half-heartedly rebuilding my vinyl collection from the 70s and 80s and I was very pleased to discover both their debut album, the famous In The Court of the Crimson King, and Lizard, in HMV. I couldn't tell you the last time I listened to ITCOTCK all the way through, but regular readers won't be surprised to read that it was probably "over thirty years" ago. No, seriously, that's just irony talking. I certainly played it at one time while living in Alsager, a period which ended 20 years ago this year, and I may even have played it at some stage while living in the village, but it's probably at least ten years since my turntable was connected up and playable. Shame not to see you at the (rather damp) fireworks display on Saturday. 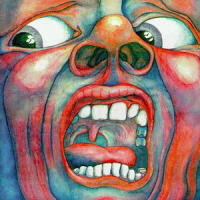 I've got Court of the Crimson King on vinyl in a box somewhere. You're right. It's very special.